heather & olive: weekend things. The most delicious post-run Iggy's bagel with smoked salmon cream cheese, heirloom tomato slices and a bite taken out of it. (I couldn't wait). This weekend was essentially a repeat of the previous weekend--I went out to western Massachusetts with my sister to visit with my grandmother and mom (which was great) and then I returned to have dinner with my dad (also great). I went for a run on Sunday morning and it was super hot, although I'm pretty pleased with myself for consistently going for runs all last week. It hasn't been pretty, but I've been telling myself that the more I do it, the easier it will get (and that one good run amidst all of the crappy ones makes it worthwhile). I've also been on a bit of a homemade ice cream kick: after perfecting the lavender honey combo, I branched out on Sunday and made s'mores ice cream with gluten free graham crackers (I made it gluten free so my dad and my sister could eat it and I wouldn't be stuck with three pints of ice cream calling my name every time I opened my freezer). The end result was delicious, and I'm already brainstorming my next batch. This week is a short one for me--I'm taking Thursday and Friday off. I was originally planning on going to Maine but I might just do a staycation here...regardless, I will be very happy with a few days sans work. A good bagel is heaven. 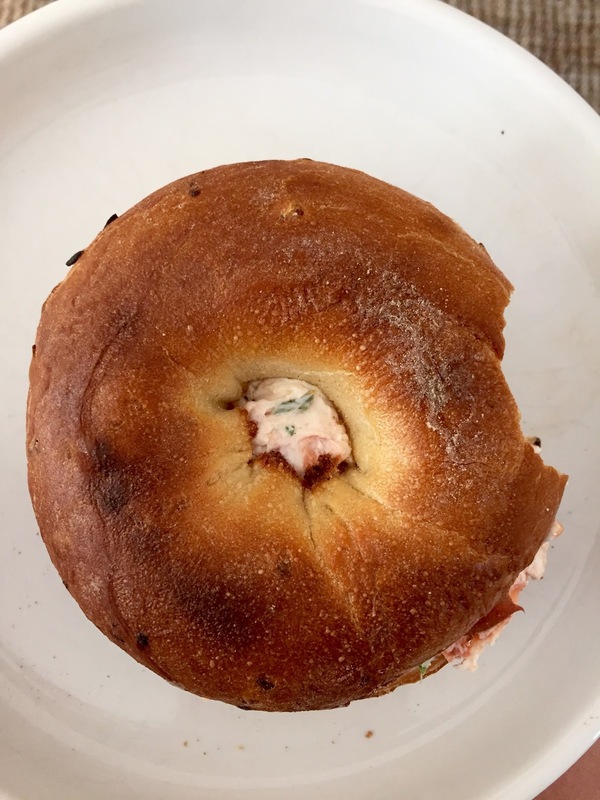 The bagel looks amazing! It seems like you had a very good weekend, full of treats and ice creams, very different from me! I need the recipe of the more ice cream stat! The life and times of a Maine girl and her french bulldog. We do what we want.